STEP 1) You have placed the following items into your Mr. Landlord Shopping Cart. You may continue shopping using the menu items to the left, or you may edit the contents of your shopping basket or take it to the checkout area. If you order at least three items in your shopping basket, you will qualify for a 10% discount off your total order. STEP 2) Reminder: If you need to edit the quantity of the item(s) you have selected, place the correct number in the appropriate "Qty" field below. If you decide not to purchase an item, simply place "0" in the "Qty" field. After making any quantity changes, click the "Recalculate" button. STEP 3) Below the list of items you have selected, you are asked if you a Cyber Club member. Be sure to mark YES if you are, so that you receive Cyber Points for your order (good toward free books and other items). 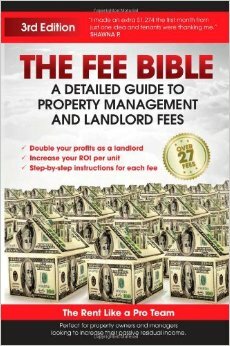 3rd Edition of THE FEE BIBLE which includes step-by-step instructions with over 27 different fees and services for landlords to use and offer to increase cash flow and professionalism. We only have a few copies left of this third edition at Half Price! For limited time, you can order 12 samples of our popular Mr Landlord Newsletters from last 12 years for just 10 bucks. We will hand-pick 12 of our best issues ($99 value!) Why are we doing this?? Because we have extra inventory. We figure why not offer them for pennies on the dollar to cover shipping and handling. You get hundreds (thousands) of dollars of cash flow building ideas for only $10. STEP 4) If you have selected all the items you wish to purchase at this time, please click the "Check-Out" button at the bottom of this page, and you will be taken to our Secure Order Form. Please note, normal estimated shipping time is 7 to 10 business days. If you prefer faster service (3 to 5 business days), you can click the Add Priority Shipping option below, then Check-out. additional charge will be added for all other countries. Are you a Gold or Book Club Member or have an AFFILIATE Code?